I interpret the rhythms, shapes and movements found in nature, without directly representing easily recognizable objects or scenes. Each painting and sculpture embodies a powerful physical presence and spirit which evolves over time from the process of manual labor and working the metal intuitively. These sculptures and paintings grew out of my interest in African art and ritual scarification, where the skin is pierced to create patterns of raised scars are created on the body to signify rites of passage. I am challenged by the ambiguity of metal—turning flat, hard, industrial material into organic forms that seem to shift and move as they reflect light. 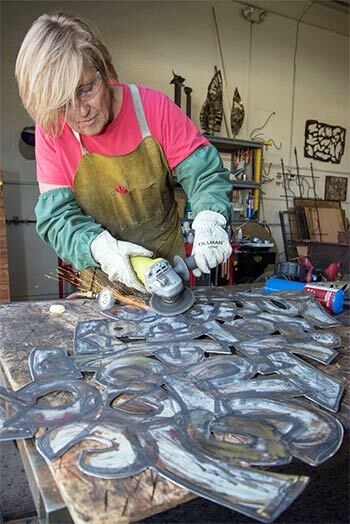 I use welding tools as one would use traditional art tools—seeking to “draw” with the mig welder, “erase” with an angle grinder, and “cut out shapes” with the 10,000-degree plasma torch. I seek to invent interesting textures and imply organic life in the industrial material. Layers of colored patinas bring the aesthetics of painting to sculpture. The shifting dark and light shapes and added color evoke feelings and invite an emotional response from the viewer. The process of developing a piece of art is analogous to the process of ritual scarification, and the process of life itself—in spite of our original plans, all require sacrifice, pain and loss in order to create something more beautiful, with a more intensely developed character. For me, part of the appeal of the process is the extreme amount of deconstruction—cutting up and taking apart—that is necessary before the work can be re-ordered as a unified organic presence.